"Relentless Justice Overcomes Spiritual/Moral Nihilism"
THE EQUALIZER 2 finds Boston’s avenging angel and protector, Robert McCall, helping several people when a woman he worked with on Special Ops missions is suddenly murdered in Belgium and McCall tries to bring his style of vigilante justice to her killers. THE EQUALIZER 2 is better and less brutal than the first movie, with strong redemptive, moral elements. It expertly combines drama, pathos, suspense, and action to tell a compelling story about sympathetic, interesting characters, but there are many strong obscenities, brief drug references, and some moments of extreme violence mixed with exciting action scenes. The story of THE EQUALIZER 2 finds Boston’s avenging angel and protector, Robert McCall, helping several people when a woman he worked with on Special Ops missions is suddenly murdered in Belgium. McCall tries to bring his style of vigilante justice to her killers. Once again, Denzel Washington stars as the titular character from the popular 1980s TV series starring British actor Edward Woodward. In the series, Woodward played a former British spy turned private detective in America who helped various threatened clients equalize the odds. 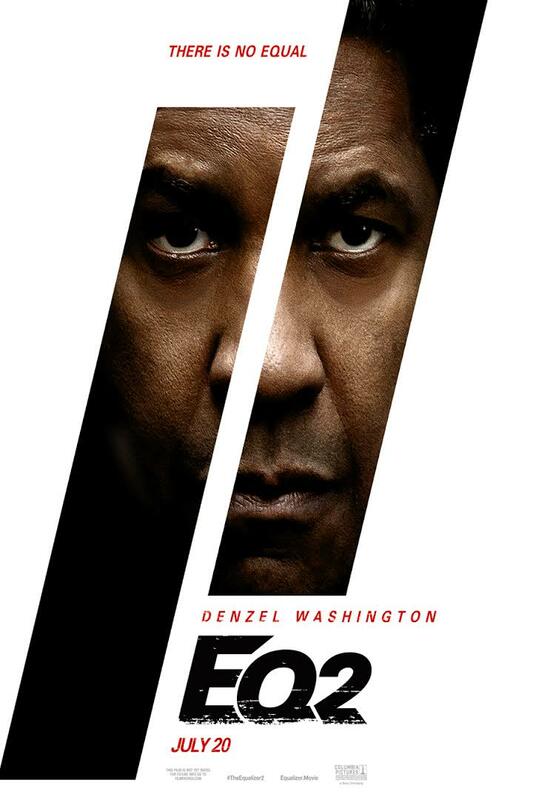 Denzel, of course, plays an Americanized version of Robert McCall in the two movies. In EQUALIZER 2, McCall travels to Turkey to force a Muslim man to return his kidnapped daughter to her mother in Boston. Back home, he befriends an elderly Jewish man trying to retrieve a painting of his long-lost sister before they got separated as children during the Holocaust. McCall also befriends Niles, a troubled black youth in his neighborhood who has a talent for drawing but has problems evading the local drug gang. McCall left the Special Forces military and faked his death after his wife suddenly died. One of his spy friends from that time, however, a woman named Susan, knows he’s still alive. She even comes to visit him when she’s occasionally in town. Susan starts investigating the apparent brutal murder-suicide of a spy from Belgium with whom she worked and his wife. The audience knows, however, that the deaths were the result of a planned assassination by four men. Susan seems to be on the verge of discovering the ruse when two street thugs viciously attack her and kill her in her hotel room in Belgium. McCall starts his own investigation and runs into his former partner, Dave, who thought McCall was dead but was working with Susan on the case. They team up together again, only to discover someone has bombed the two thugs who murdered Susan. They’re cleaning up loose ends, McCall advises Dave. Will they find out who murdered the spy from Belgium and bring Susan’s real killers to justice? THE EQUALIZER 2 takes its time to get to the main story about avenging Susan’s murder. However, until then, it presents an absorbing story showing the compassion and righteous outrage that fuels McCall’s sense of justice and makes him right wrongs, help people and teach bullies a lesson. For example, instead of just reading Niles the riot act about going regularly to school, McCall entices him with a project to clean up some graffiti that damaged a wall mural at McCall’s apartment complex. Eventually, though, he has to warn off the local drug gang from trying to recruit Niles. Consequently, although the movie spends some time showing McCall befriending people in his neighborhood and working as a Lyft driver in the city, McCall gets several opportunities to use his military skills to help people and fight bad guys. In the movie’s exciting final battle, McCall actually has to defend himself from the merciless men who had his friend, Susan, murdered. It’s really thrilling to watch how he’s going to survive. THE EQUALIZER 2 is better than the first movie. It’s not quite so brutal and is more suspenseful. As such, it expertly combines drama, pathos, suspense, dialogue, and action to create a compelling story about sympathetic, interesting characters. The movie also has some redemptive themes. For example, Niles signs his artwork “The Right Hand of God,” next to a sketch of his brother, an amateur boxer who was shot dead leaving school one day. The inscription is a reference to his brother’s joke that his right hook can figuratively “send” people to Heaven in the ring (or knock them out). Also, when McCall confronts the main villain toward the end, the villain tells McCall there is no sin any more, no right and wrong, and that survival is the only thing that matters. Of course, McCall assures the villain he’s wrong, that there will be a reckoning and that McCall will be the one to provide that reckoning. Finally, McCall not only has words of good advice to Niles, about making the right choices for the future. McCall also thinks about his late wife, and the movie implies that his relationship with her is a major reason McCall wants to help other people. Eventually, McCall literally has to go through a storm to find some peace of mind and spirit about his past. All that said, THE EQUALIZER 2 features lots of strong foul language. For example, there are a fair number of “f” words, especially during the climactic battle. Also, there’s some extreme violence with blood, including a couple blood splatters when people are shot point blank. In addition, when fighting several bad guys, McCall deliberately breaks some bones, legs, hands, and fingers. Also, the two thugs attacking Susan brutally throw her around the room, including against walls, a mantel, and photos enclosed in glass. Finally, one villain fatally stabs her in the stomach as she looks, a long bloody cut running down her face. So, MOVIEGUIDE® advises extreme caution. Please also note: In Turkey, McCall poses as a Muslim imam to get close to the man who took his daughter away from her mother in Boston. Also, in Boston, one of McCall’s neighbors is a middle-aged Muslim woman with a scarf over her head whose community garden is wrecked by neighborhood children. In previous decades, such a supporting character probably would be a Roman Catholic lady from South Boston. In a movie set in New York, they might be Jewish or Italian Catholic. Enough already with these politically correct nods to Islam in today’s Hollywood movies! Kidnapping, home invasion, gang activity, villain makes a nihilistic argument to hero, and teenager has been skipping school, but he’s admonished about it and advised to stop wasting his talent. THE EQUALIZER 2 finds Boston’s avenging angel, Robert McCall, helping several people, including a teenager, a mother, a party girl, and a Holocaust survivor. McCall left the Special Forces military and faked his death after his wife died. Only one of his spy friends from that time, a woman named Susan, knows he’s still alive. She even comes to visit him when she’s occasionally in town. Susan is murdered overseas while investigating the faked suicide of a Belgium spy she handled. So, McCall springs into action to find her killers. THE EQUALIZER 2 takes its time to get to the main story about avenging Susan’s murder. Until then, however, it presents an absorbing story showing the compassion and righteous outrage that fuels McCall’s sense of justice and makes him right wrongs, help people and teach bullies a lesson. The movie expertly combines drama, pathos, suspense, action, and sympathetic, interesting characters. EQUALIZER 2 has a strong Christian, redemptive, moral worldview, but there’s lots of strong foul language, brief drug references, and some extreme violence. So, MOVIEGUIDE® advises extreme caution for THE EQUALIZER 2.